Explanation: A1 & A2 Evidence of at least 28 pairs of Syrian Serin (regional endemic sp. ), found only in the Middle-East. A3 13 Biome-restricted bird species breed here, mostly from the Irano-Turanian Biome (7 species), including White-throated Robin, Upcher’s Warbler, Pale Rock Sparrow, Crimson-winged Finch, Syrian Serin and Black-headed Bunting. 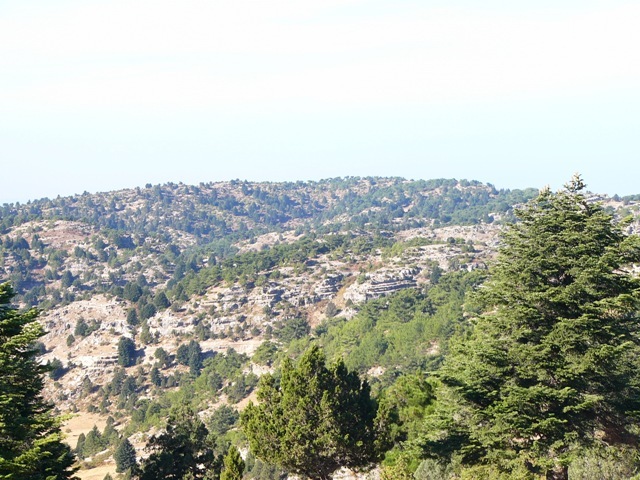 Habitat: Mountainous forest dominated by Turkey Oak, Fir, Cedar of Lebanon and Juniper, with Calabrian Pine found at lower altitudes. Open areas of grassland and bushy scrub with small amounts of cultivation scattered around the site. At higher altitudes, rocky cliffs, and in Wadi Jouhannam fast flowing streams are evident. Other wildlife interest: Great floral diversity (at least 500 species), in addition to the presence of the Persian Squirrel. Threats: Hunting, over-grazing, uncontrolled wood-cutting, urban development and solid waste dumping. Current conservation measures & future plans: awareness training in site monitoring and bird identification has been implemented. Discussions are on-going with local municipalities. Future – whole site is part of planned National Park and the MADA organization is implementing a major project working towards the conservation of the site with the local community.